Blanch the asparagus in batches for approx. 3 mins., remove, refresh in ice-cold water, drain and place on a cloth. Lay out the slices of ham, place approx. 3 asparagus on top of each slice, roll up. Cut the dough lengthwise into strips approx. 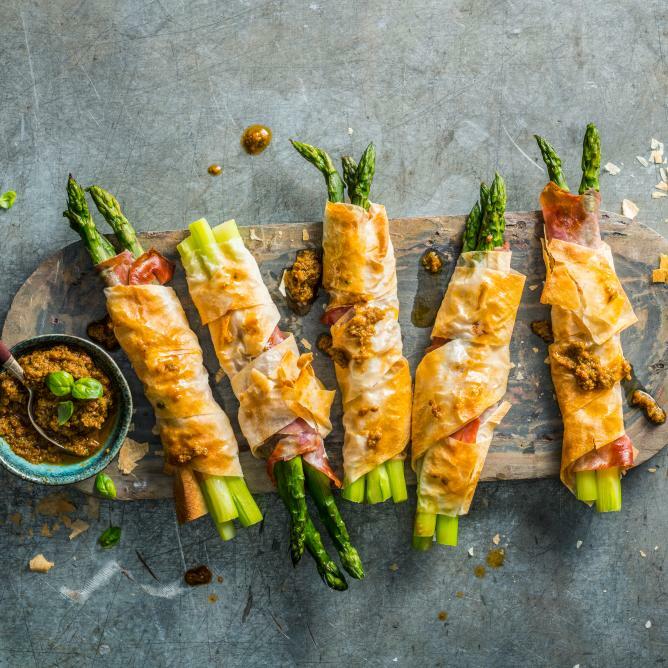 3 cm wide, loosely wrap the asparagus rolls in the dough, transfer to a baking tray lined with baking paper, brush with oil. Approx. 15 mins. in the centre of an oven preheated to 200°C. Serve lukewarm. Puree the tomatoes, oil, balsamic, water and basil in a blender. Season the pesto. Serve with the asparagus rolls.